Indian Giver is an art exhibition about cultural appropriation, and its next stop could be the mall or a music festival. If Sage Paul and Erika Iserhoff get their wish, the next place you'll see their latest art show will be at the mall. Urban Outfitters, specifically — international purveyor of faux-vintage record players and dorm-room décor, and a retailer that's been in a legal battle with the Navajo Nation since they started using their name to describe everything from printed flasks to underpants. "Cultural appropriation is always in the news," laments Paul with a laugh, and she says that with more authority than most. The Toronto artist jokes, half-seriously, that she's become a go-to talking head when the CBC's running a story about, say, DSquared being chosen to design the Canadian Olympic uniforms, or controversy over a collectible cat figurine branded "Chief Runs With Paws." "It's always about asking if something's making me angry or not," says Paul — when the artist is making a career based on taking action. 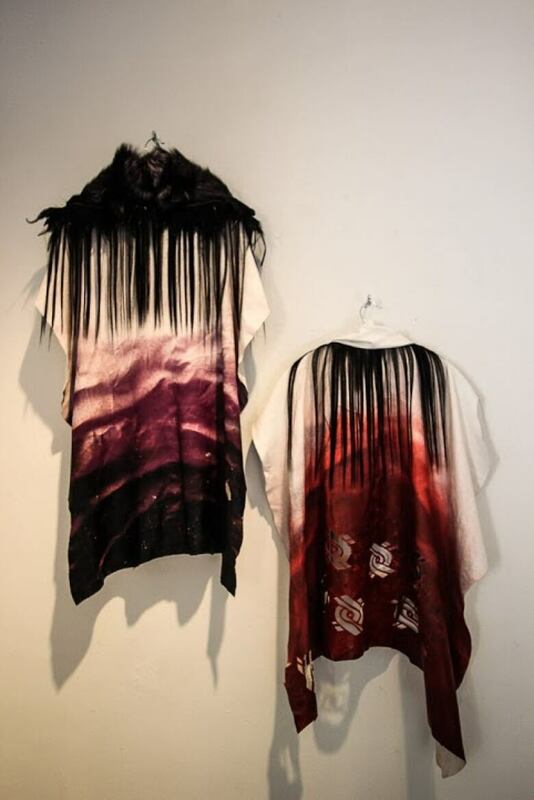 Along with Iserhoff, Paul is the co-founder of the Setsuné Fashion Incubator. 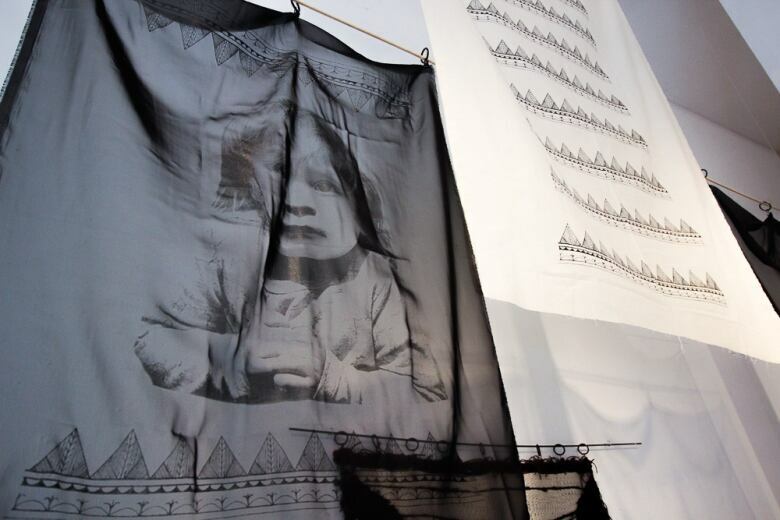 Based in Toronto, the non-profit supports Indigenous women in fashion and the arts while connecting them with a community of people skilled in traditional techniques. 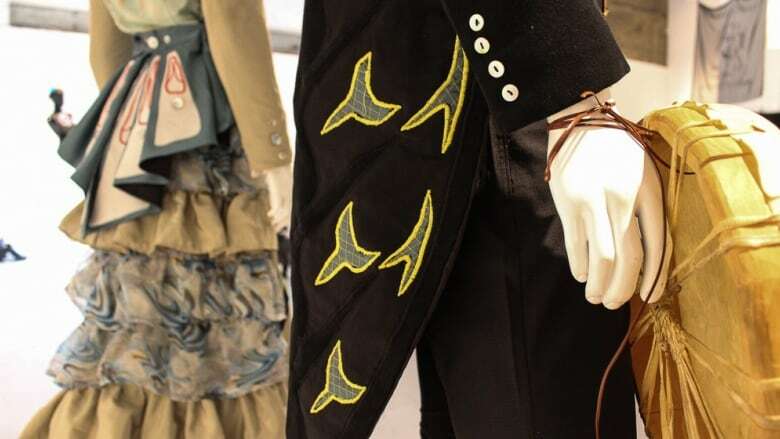 The vision, they say, is to build a reality where First Nations artists and designers, skilled with an understanding of their cultural practices, are players in the fashion industry. If artists like those coming out of Setsuné are involved in the actual making of the fashion culture, "I think it really takes away the opportunity for cultural appropriation to happen," says Paul. It's the difference, they say, between Valentino consulting and collaborating with Métis artist Christi Belcourt on every colour and flower before a garment hits the runway vs. DSquared saying a collection, named after a racial slur, was inspired by "the enchantment of Canadian Indian tribes." 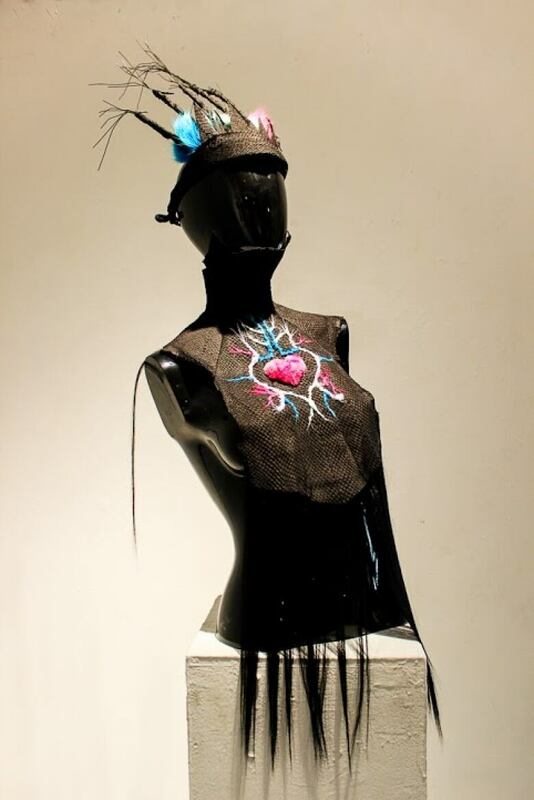 In the meantime, though, the conversation is still in progress — and that's where the duo's new exhibition of wearable art, Indian Giver, comes in. It's a loaded title, but as Iserhoff explains, it's bang on what they're hoping to express. "The derogatory term 'Indian giver,' it sort of means taking back what was given, and in this show we're doing that," Iserhoff tells CBC Arts. "We're taking back our story, telling how we want to tell it. Taking back our voice." Featuring eight contributors, Paul (Dene) and Iserhoff (James Bay Cree) included, the artists hail from First Nations communities throughout the Western Hemisphere. 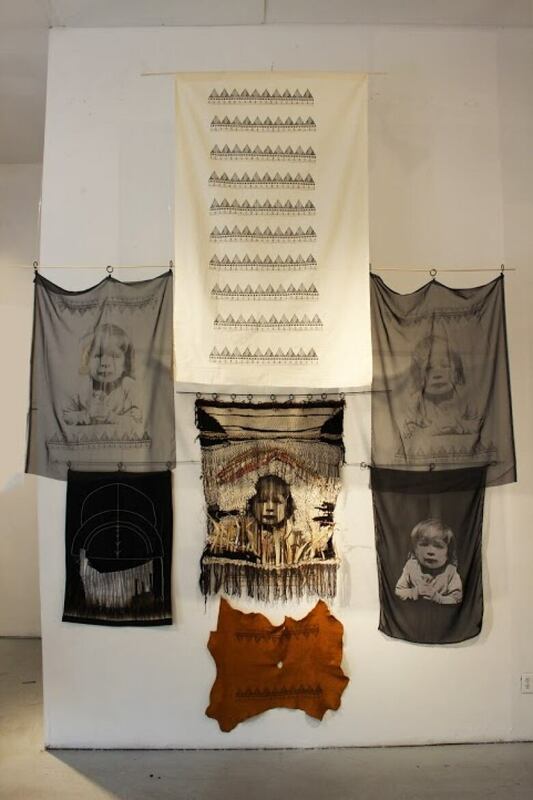 Iserhoff's "Lack of…" is a bolt of gauzy silk organza that hangs from the ceiling, printed with the surreal repeating pattern of rotting wisdom teeth — a reference to traditional Lakota dresses adorned with elk teeth, but also a statement on the painful lack of cultural wisdom at play when a designer uses traditions that do not belong to them. 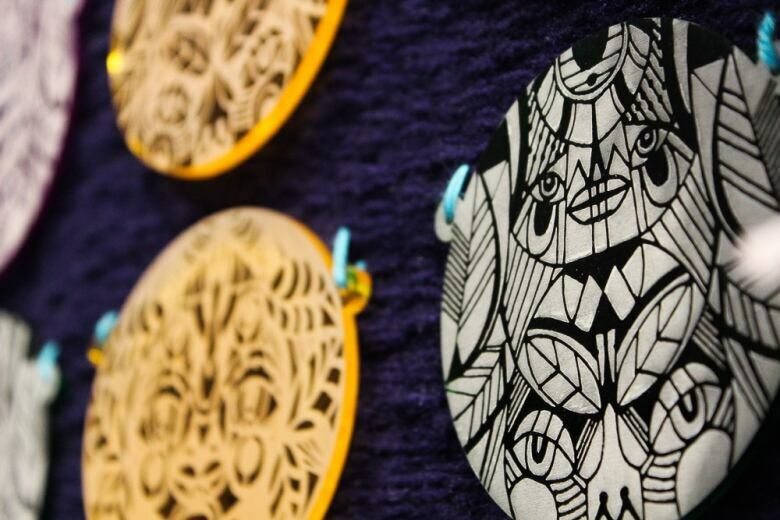 "The Weaved, The Lasered, The Medallion," by Lido Pimienta (Wayuu) incorporates weaving, embroidery and crocheting — all ancient techniques — but also laser-cut medallions, over-sized and modern acrylic objects meant to be worn as jewellery. There's no such thing as a singular aesthetic here, and that's the point. Every item is unique, though in its own way contemporary or speculative of an alternate reality. Showing that diversity was crucial to the show and how it aims to detonate the whole problem of cultural appropriation, says Paul. "I'm expected to be a certain way, even sometimes within my own community — and just in the public generally — to be a specific kind of designer, and I think that comes from the idea of cultural appropriation because we really are expected to be Indigenous or have a specific look," says Paul. 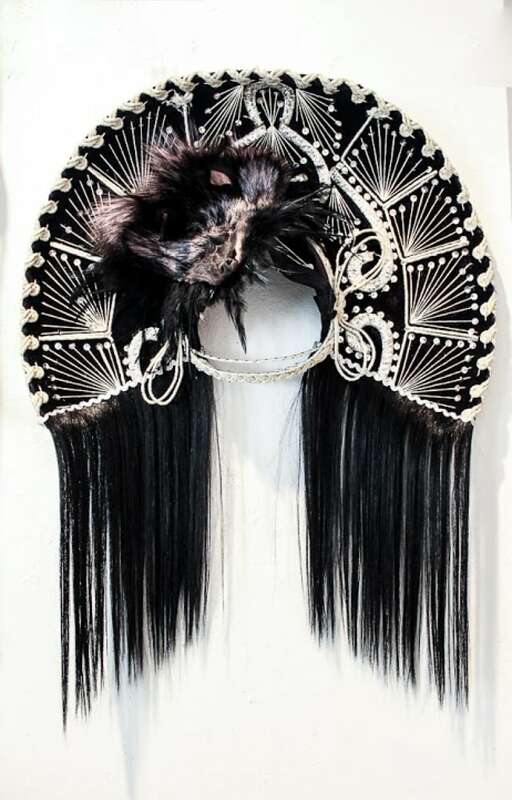 "Indigenous fashion is just fashion made by Indigenous people in whatever form that might be," says Iserhoff. 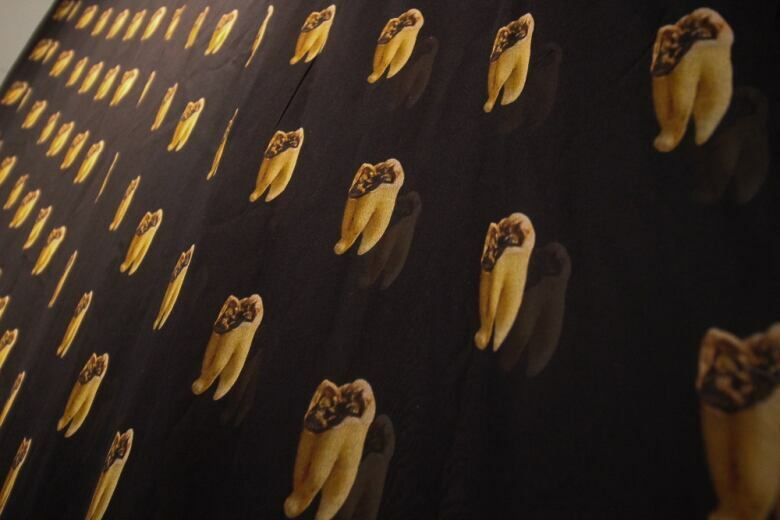 "This exhibition really allowed us to look at our own ancestry and our own traditions and the work is really diverse. It's modern and some of it is very ancient. We're able to really look back at how we can present ourselves," says Paul. So why not present that vision to as many people as possible? The garments inside Indian Giver are on display at Toronto's Gallery 1313 to June 19, and though you wouldn't mistake the pieces for anything on sale at the vintage shops and boutiques down the street on West Queen West, Paul and Iserhoff envision the collection someday moving to the mall. "Or a music festival!" suggests Paul. "I think the possibilities are huge." "For me, having [Indian Giver] in the artistic space is really important but there's always this problem of speaking with people are automatically on the same side, for lack of a better word. How do we access a larger audience — people who are just more about fashion, and those people who hide behind their computers and the comments section. How do we reach those people?" she asks. "I think it's crazy that we're still having this conversation," says Iserhoff. "It's just weird to me to think that someone can go in and use our stuff and think it's 'inspiration' when it's just theft." Indian Giver panel discussion. Moderated by Denise Bolduc. Saturday, June 18, 2-4 p.m at Gallery 1313, Toronto.